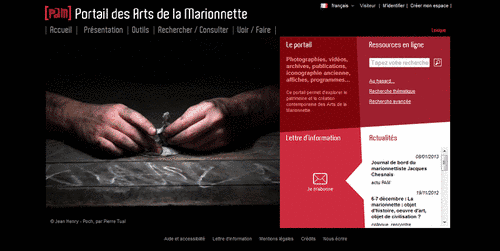 The Portail des Arts de la Marionnette (Portal of Puppetry Arts), commonly referred to as “PAM”, began in 2008 following the surge of interest in the wake of the “Saisons de la Marionnette 2007-2010″ (Seasons of Puppetry 2007-2010). This four-year national event was coordinated by THEMAA (UNIMA France), which seeks to encourage all the stakeholders of puppetry in France, supporting their efforts to promote the profession through training, research, publishing and the like. PAM collects and provides documents and information regarding the puppetry arts, including object theatre, shadow theatre, paper or toy theatre, and associated arts. Currently, the PAM website presents more than 30,000 exhibits, including photographs, posters, prints, drawings, vídeos, audio recordings, magazines and periodicals, manuscripts, notes on staging, etc. All these documents are supported by documentary and encyclopedia references and articles regarding performances, companies, the artists, and other topics. PAM will be updated in the coming months to include both a news section with a directory and calendar of events, as well as a new, shared catalogue linked to libraries and resource centres specializing in puppetry. PAM has participated in and prompted several projects of digitization of materials. These have been funded in France by national programmes supporting the digitization of heritage and contemporary materials and in Belgium by the “PEPS” programme. The objective is to preserve and diffuse public archives portraying these arts and their practice. Today, PAM gathers digitized content from twenty-eight French institutions. In 2013, it began collaborating with organizations in other countries and will link its efforts with ten Belgian institutions. In addition, several Spanish institutions are preparing to participate in this huge project. The website will further evolve in the coming months and become trilingual (French, English, Spanish). A founding partner of PAM, the Union Internationale de la Marionnette (UNIMA) had digitized an important portion of its own historic archives in 2009. Today, it collaborates with PAM to present on the PAM website new documents reflecting the organization’s activities and those of its national centres. These include: Copies of UNIMA newsletters, Reports of UNIMA congresses, The journals of national centres: Pelusin El Mensajero (Cuba), Nukke-Teatteri (Finland), Dockteatern (Sweden), UNIMA Portugal magazine (Portugal), The World Encyclopedia of Puppetry Arts (WEPA) project, Photos and vídeos.